If we added your radiostation to the QuickRadio sofware and/or if we added your radiostation to our online player, you can order a personalized button for your website. Free of charge! Here you'll find the listeningfigures of the QuickRadio player per month. Online weblisteners are NOT included. Donateware is a licensing model that supplies fully operational software to the user and requests a donation be paid to the programmer. The amount of the donation may also be stipulated by the author, or it may be left to the discretion of the user, based on individual perceptions of the software's value. If you like QuickRadio and you like us to develop it, we appreciate your donation by PayPal. If you haven't PayPal, please contact us for other payment possibilities. 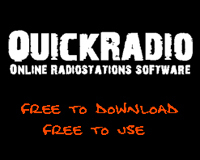 QuickRadio is a project of AtWorX.com. AtWorX.com is an internetcompany from The Netherlands, specialized in developing domain names/websites and Domain Resource Management. For more information, please visit our website. Please contact us if you have any feedback. QuickRadio software was made by A. Vliegen.